My god am I glad to see the back of April. It was not a good month. My health wasn’t great and I was suffering badly from depression and anxiety, so overall my morale was pretty low. In April we lost a close family friend and it was completely unexpected. I’ve never had to experience a loss this sudden before. It was one of those events that made me realise how precious life is and that sometimes I really do take it for granted. My hip has been in pain for pretty much the entire month and I had to wait until the end of April to have another steroid injection because I couldn’t get an earlier appointment. As I result, I couldn’t get out and explore as much as I would have liked, and this was such a shame as the we had a week of gorgeous weather last month (it’s cold again now). However, I did start learning to drive again, which was probably the highlight of the month. I’m thoroughly enjoying it, and I’m hoping it won’t be too long before I’m taking my test and hitting the roads. 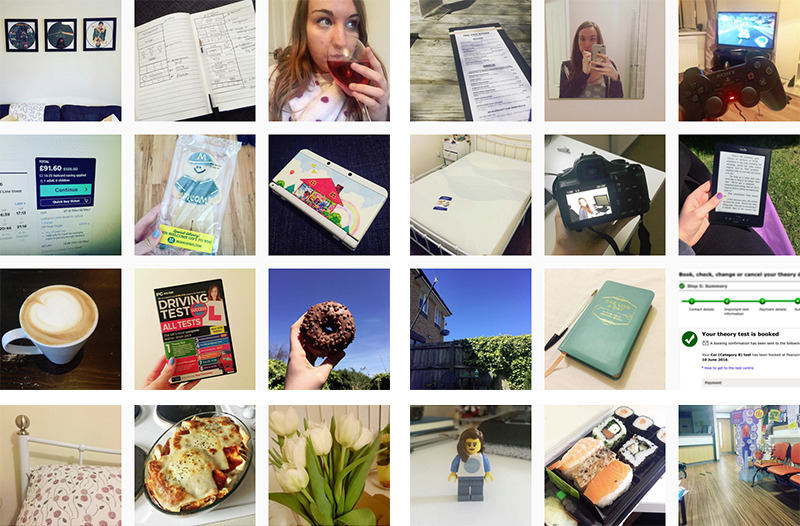 I was so crap at blogging last month. I’ve been so down about my hip and other life events that I just haven’t felt like publishing anything online. I’m feeling a little more reassured about my writing skills after The Blog Market shared one of my posts on their blog, and I was reminded why I blog after meeting up with Anca and Katy for coffee last week – because I love the social side of blogging! I’m hoping that May will be a better month for the blog and I won’t go all quiet on you guys again. April turned out to be an expensive month due to paying my council tax bill, but I was determined, as ever, to save something. And so I put away £366 bringing my grand total of savings this year to £1,554 so far. This month I’m heading down to Hartfordshire for a week to work, and it’s actually going to happen this time (I was suppose to go in April but it was postponed). I’ve also got my driving theory test booked for when I return from my trip so I will be doing lots of revision over the next few weeks. Following my steroid injection on Friday, I am determined to starting working out my legs more. I’m going to try yoga more frequently (every day when I can) and also start swimming again. I’m not going to let my muscles around my hip disappear again. Another goal for May, along with passing my theory test and getting fit again, is to book a holiday because I NEED one. Like, so badly. How was April for you? Do you have any plans for May? Aw man, I am sorry April was tough. You made it through though! I’m sorry to hear about your family friend. It can be tough reflecting on it and even just mentioning it as well. I know that I’ve lost some family members in the past and have not been sure what to feel because I wasn’t close to them, but it was still really upsetting. At present, May looks quite busy for me – Mother’s Day, my dad’s birthday, my birthday and Lilian’s birthday – I have a work hackathon as well. And of course I will be getting ready for our trip to Europe. It’s pretty cool that you get to travel a bit for work. I would love to do that! But we don’t do much in the way of client work or things like that, so we are in office most of the time. We get to work remotely if we want, but it can be a challenge. Ahhh, yoga. ♥ I can’t say anything I dislike about yoga. Honestly, even when I was doing weight lifting, I wasn’t feeling my strength build like I do with yoga. I don’t know what it is about it–the mindfulness, the average 30-or-more-minute sessions, or all those planks–but my body has never felt stronger since I started doing yoga frequently.